“Sweet China” (as she was known during her racing career) was born on January 25, 1995 in Lee County, Florida. She was one of four females in a litter of six pups born to “Sweet Louie” and “China Maid”. Her first race took place at Flagler Stadium in Miami, Florida on July 24, 1996. She finished second on her first time out – not bad for a beginner! Over the course of the next two and a half years she raced at Flagler and Hollywood (FL) race tracks, running her final race on November 7, 1998. Of the 150 races that “Sweet China” entered, she finished first nineteen times. She finished in the top three positions in 57 of her races, a very respectable record. Anyone who knew her would not find that surprising, as she was a very determined and strong-willed dog. “Sweet China” made the journey to a greyhound adoption group based in the San Francisco Bay Area, “Greyhound Friends For Life”. She arrived at the GFFL kennel in Gilroy, CA (the garlic capital of the world) in February 1999. The kennel was managed by a wonderful GFFL volunteer, Barbara, who had her hands full with this spirited ex-racer! I adopted “Sweet China” (and gave her a new name) a week or two after her arrival at the GFFL kennel, in March 1999. Normally greyhounds spend several weeks at a ‘foster’ home where they become accustomed to living in a home before being adopted, but I had no such luxury! The first few weeks were a challenge as I taught Chloe how to go up and down stairs, walk on a leash, and basically how to be a house pet. The eight months that Chloe spent with me in San Francisco were busy ones, as she visited many sites in the city including the Golden Gate Bridge, Palace of the Legion of Honor, Dolores Park, Mt. Davidson (the highest point in the city), Golden Gate Park, and Marin County. She even made a trip to Stanford University (but, alas, no sighting of Chelsea Clinton who was a student there at the time). Chloe left the beautiful San Francisco Bay Area in November 1999 when she moved with me to the Sauganash neighborhood on the northwest side of Chicago. After spending her entire life in Florida and the temperate climate of coastal California, I’m sure she questioned my sanity during those long Chicago winters. But she had a full complement of coats and sweaters to guard against the cold, as well as a yellow slicker to stay dry during the spring rains. She became a bit of a celebrity in the neighborhood and was known by name to many whose houses we passed on our daily walks. She enjoyed the love of family and friends, and she returned that love many times over. 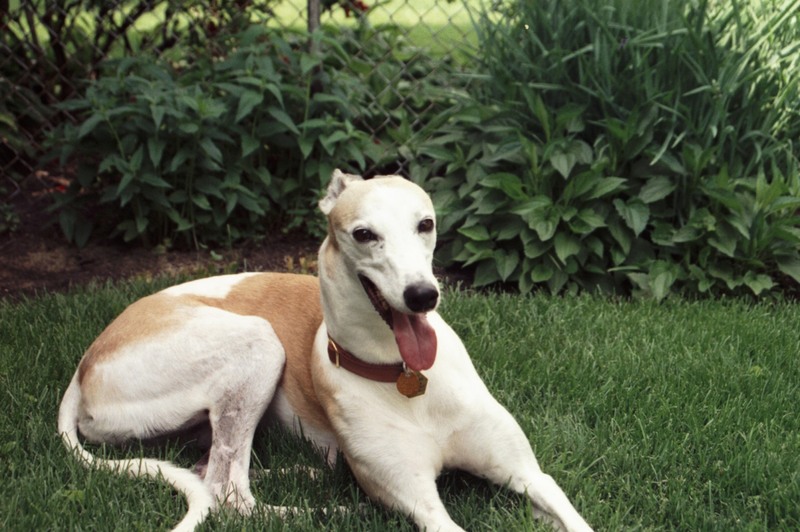 In November 2005 Chloe was diagnosed with inoperable osteosarcoma, a cancer of the bone that is fairly common in greyhounds. Chloe was very brave and stoic during her illness, and we all got to enjoy a very special, though poignant, final Christmas with her. On January 10, 2006, with her head resting in my lap in the comfort of her home, and surrounded by those who loved her, Chloe bid us farewell and peacefully crossed over the rainbow bridge. She is missed tremendously but she continues to live on in the hearts of those whose lives she touched. Kevin and True will share a page on my website because they came to me as a pair and they were together for many years. True (short for her racing name Kiowa Terrortrue) was born on June 6, 2000 in Wisconsin. She is one of five females in a litter of six born to Flying Train and Mohican Terror. Her racing career began at Dairyland Park in Kenosha, WI on January 15, 2002 with a win! Over the course of her career she placed first in 17 of her 139 races, and finished in the top three positions 51 times. Besides Dairyland, she raced at the Geneva Lakes track in Delavan, WI as well as the Tri-State track in Cross Lakes, WI. True retired after her final race at Geneva Lakes on January 15, 2005. Kevin (short for his racing name, System Rev Kevin) was born on October 15, 1999, the last in a litter of nine from Rocksteady Eddie and Vals Emily. Kevin started his racing career in Tampa, FL on August 25, 2001 with a 3rd place showing. Over the course of his 131 race career Kevin racked up 16 first-place wins. He placed in the top three positions 51 times. Kevin alternated between the track at Tampa and the Derby Lane track in St. Petersburg, FL until late 2002, when he made his first appearance at Bluffs Run in Council Bluffs, IA. Kevin then moved on to Geneva Lakes, WI in October 2003, where he remained until his last race on February 29, 2004. 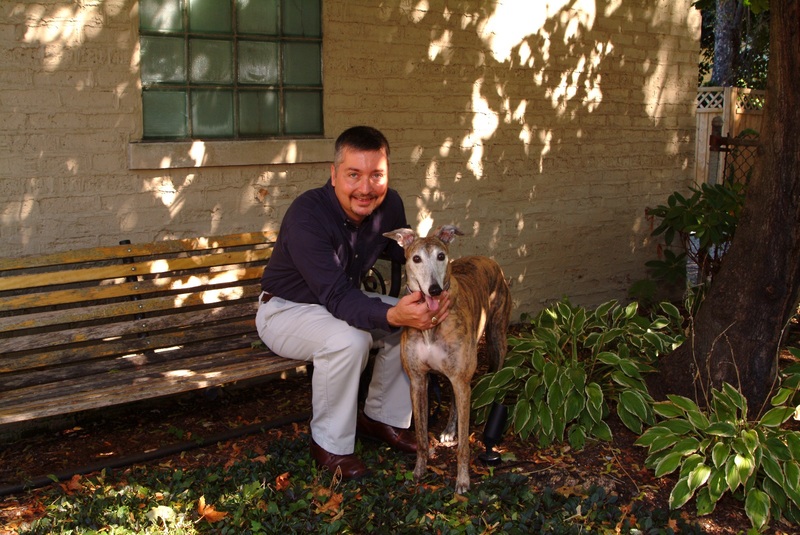 Kevin and True were adopted by a family in Wisconsin who had ties to the greyhound racing industry, so they did not actually go through an adoption group immediately after retirement. They spent almost two years together in their first home but did not receive much attention. They were kept in the same cage together throughout the day, which can be dangerous because it does not allow the dogs to separate from one another should tensions develop. True developed a serious dental and gum disease which ultimately resulted in the loss of most of her teeth. 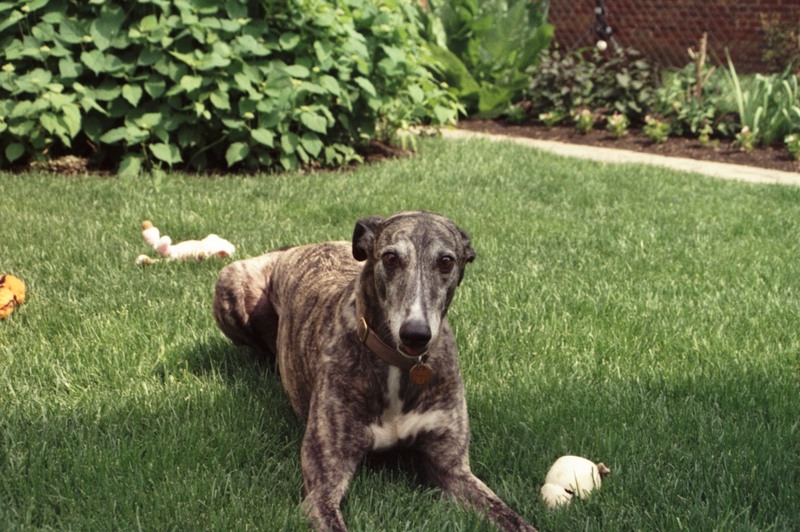 Kevin and True’s first family had to give them up for personal reasons, so they were taken in by Midwest Greyhound Adoption (MGA) in Sugar Grove in October 2006. MGA called me because they knew that I had lost Chloe earlier in the year and I had spoken about adopting two greyhounds at some point in the future. MGA wanted to place them in the same home because they had become so bonded to one another over the previous two years. They got along extremely well together and were definitely a pair for life. They were both extremely thin and had some health issues when they first came home, but over time they gained some much-needed weight and their overall health improved. They frequently appeared together at area greyhound ‘Meet & Greet’ events and were great little ‘ambassadogs’ for raising awareness about the breed and greyhound adoption. They enjoyed living in the Sauganash neighborhood and loved meeting new people and exploring the area. In February 2011 I discovered a lump on True’s rib cage, which turned out to be a cancerous tumor for which there was no cure. Despite the growth of the tumor True was able to enjoy her remaining days and the love that she received from her family. True crossed over the rainbow bridge on May 3, 2011, in the presence of her family and her special love, Kevin. On May 1, 2012, almost a year to the day after True’s passing, Kevin joined his love True at the rainbow bridge. Although I miss them both tremendously, I am comforted by the thought that they are together again.